55 Hours: A day-by-day account of the events of early July, 1981. Using the timeline created with documents from ‘Mountain Climber’ Brendan Duddy’s diary of ‘channel’ communications, official papers from the Thatcher Foundation Archive, excerpts from former Taoiseach Garrett Fitzgerald’s autobiography, David Beresford’s Ten Men Dead, Padraig O’Malley’s book Biting at the Grave, and INLA: Deadly Divisions by Jack Holland and Henry McDonald, Danny Morrison’s published timelines, as well as first person accounts and the books of Richard O’Rawe and Gerry Adams, the fifty-five hours of secret negotiations between British Prime Minister Margaret Thatcher and Gerry Adams’ emerging IRA leadership group are examined day by day. At 1am Monday morning, an hour after the tantrum the Adams Group had thrown to weaken the position of the ICJP with the British, the channel resumed track. The British had been waiting on the result of Morrison’s visit to the hunger strikers to be briefed on the resulting position – would their initial offer be the basis for crafting a settlement? What the Adams Group communicated through the channel shows that Morrison’s visit was completely unnecessary in regards to being able to give the British their true position. They added nothing new to what they had earlier conveyed to the British while Morrison was in the prison. In other words, if the British go behind the Adams Group’s back, either via the ICJP or some other means of communicating with the prisoners, the Adams Group would veto any such agreement. Kept in the dark and denied the ability to agree to any offer, the prisoners clearly were not in control of their protest. In terms of finding an agreed form of words that would bring an end to the hunger strike, Morrison’s visit to the prison was utterly pointless and, given the status of Joe McDonnell’s conditition, a waste of valuable time. For the Adams Group, however, his visit was not time wasted. It achieved their objective of stopping the ICJP from getting the hunger strikers to agree to any offer from the British and ending the protest. By derailing the ICJP initiative and insisting on a veto to any final agreement with the British, the Adams Group was ensuring they alone had total control over the prison protest – to use to their own ends – and would not be surprised or usurped by the prisoners again. This is a complete change from what the Adams Group had told the British late on Saturday night. Only a few hours ago their stated position was that the ‘demands dealing with work and association could be subject to a series of discussions after the ending of the hunger strike’. Adams and Morrison spent the afternoon informing the ICJP of their secret talks with the British, and demanding that the ICJP cancel their upcoming meeting with the NIO. The fallout from this was predictable enough – the ICJP was ‘stunned by disclosure’, and ‘confronts [Michael] Alison [NIO contact]’. According to Garrett Fitzgerald, the ICJP were ‘furious at this development’. When they confronted Alison about the secret talks, however, he was so obviously astonished that the ICJP were convinced ‘that he didn’t know the second line of contact’ was opened and was ‘as much in the dark’ as the ICJP had been. [T]he only people [Jackson] could say knew for sure about the Mountain Climber initiative at that point were himself, McFarlane, block OCs Pat McGeown and Sid Walsh and the PRO Richard O’Rawe, and the hunger striker, Joe McDonnell. As for the rest, [Jackson] says, it would have been on “a need to know basis”: the closer a hunger striker got to dying the more likely he was to know. Mickey Devine and Kevin Lynch, the INLA members, wouldn’t have been informed, one way or the other, nor would the hunger strikers who were still on the blocks. The rest of the ICJP’s afternoon and evening were spent pushing Alison on their proposal to end the strike, and they secured an agreement that the NIO ‘would see the prisoners with the governor by mid-morning the following day, Tuesday’. In parallel with these discussions we have been approached by a third party who is trusted by the top Provisional leadership. Again, no negotiations have been taking place but it is obviously only sensible that if the Provisional leadership wish to communicate something to us indirectly about this critical problem, we should not refuse to listen. They have set out the kind of approach which they would find acceptable as a way of bringing both the strike and the protest to an end – and their views are important because so far they seem to be largely in control of the strikers. (a) They are no longer pressing for differential treatment for “their” prisoners. (b) the degree of association they would be allowed. (c) The statement would also have to be more precise (and it is suggested, but not insisted upon, more generous) about the arrangements for restoring lost remission. (d) That statement would have to be shown to, and be acceptable to, the Provisional leaders before it was published. This position is in keeping with Brendan Duddy’s assessment of the Adams Group position articulated through the channel throughout Sunday. Was Atkins reporting the detail of the channel communications, or was someone else from, or close to, the Adams Group talking to someone from the NIO? The detail in his minute report is remarkably similar to the Adams Group position described in the channel records. However, according to statements he made to author Padraig O’Malley published in 1990, Atkins appears to be yet another person who at the time was completely in the dark about the secret talks. Atkins does make clear to O’Malley that ‘any contact with HMG’ would not have been under his control – so it is unlikely he would have been privy to the full details of the secret talks. This makes his knowledge of the detail of the Adams Group position more intriguing, and may also account for his recommending ‘standing firm’ as the preferred course of action in the minute report. As it was, Thatcher was already pursuing an alternative suggestion of his, which was to use a combination of the ICJP and direct, “channel” negotiations with the PIRA as represented by the Adams’ Group. Who Exactly Was Leading Who? Atkins’ observation that the views of the Provisional leadership – the Adams Group – were “important” because “they seem to be largely in control of the strikers” shows an awareness by the British that the prisoners themselves were not in control of their protest. This perception accounts for why he considers “simultaneously showing the terms to the Provisionals” as a course of action – to his thinking, the objective would be “to try to swing their leadership behind the strikers”. In other words, at this point it was the outside leadership – the Adams Group – keeping the hunger strike from ending, not the prisoners themselves. Other key observations by Atkins in this report are worth noting. As he outlines the various courses of action open to the British as a response to ongoing developments, he demonstrates a nuanced understanding of the emerging leadership from the Adams Group and the pitfalls the outcome of the hunger strike holds. This understanding is important for the British because they have already identified that the Adams Group wants to lead the Republican Movement away from armed struggle and into politics, and it is in their interests, obviously, to support or at least not get in the way of that change. He notes that if “the hunger strikers give up their fast in spite of the instructions of the Provisional leaders” it would “be a severe blow” to the Adams Group – again underlining the balance of control of the protest; he reiterates this later, saying that if the hunger strike collapses, it can “leave the Provisional leadership humiliated ”. He is also aware that the Adams Group “regard the ICJP as an intrusion’ and would “be looking for a way of claiming a “victory””. The Provisionals need to the settle the prisons problem on terms they can represent as acceptable to them if they are to go on – as we know some of them wish to do – to consider an end of the current terrorist campaign. A leadership which has “lost” on the prisons is in no position to do this. While Atkins’ recommendation to Thatcher is to stand firm, he is keenly aware that such a stance would be counterproductive to their own longer-term self interests. If they took the course of standing firm, it would only end up “discouraging the Provisionals from switching from terrorist to political activity at the very moment when we know that they have begun to find political action attractive ”. The British end of the channel, meanwhile, was working on the draft statement. 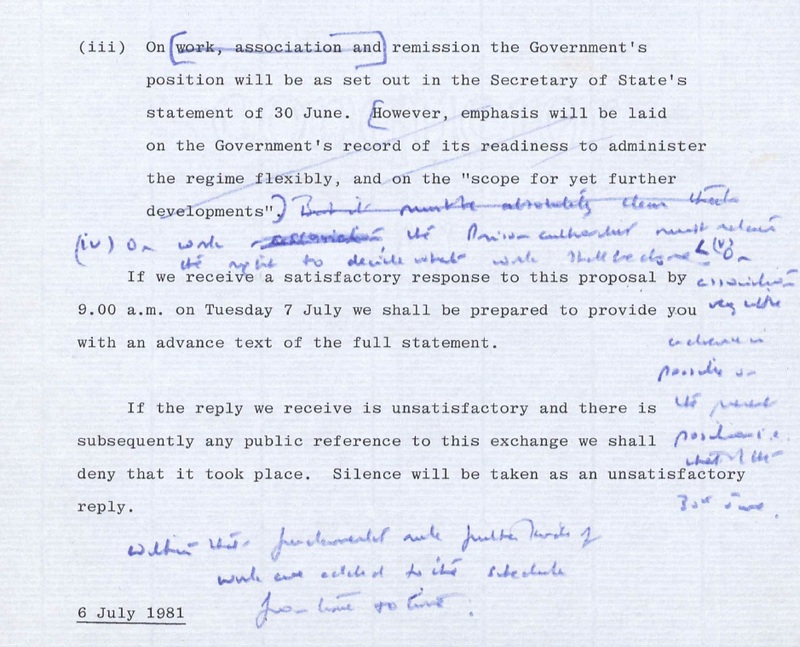 Thatcher’s input, handwritten on the British copy, informed the statement that went down the channel as a reply to the Adams Group at 11:30 that night. 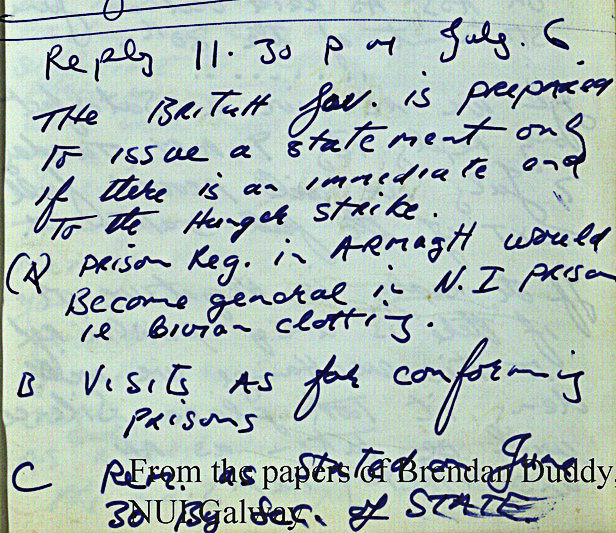 The British Government is prepared to issue a statement only if there is an immediate end to the Hunger Strike. 1. Prison regime in Armagh would become general in NI prisons i.e. civilian clothing. 2. Visits as for conforming prisons. 3. Remission as stated on June 30th by Secretary of State, Humphrey Atkins. 4. On work – the prison administration must maintain the right to decide what work should be done. Within that rule, further kinds of work are added from time to time, i.e. Open University, Build a Church (O’Fiach’s idea), Toys for spastic children. 5. Little advance is possible on Association as laid out on June Statement of 30th. If we receive a satisfactory reply by 9:00am Tuesday 07/07/81 we will provide full text of the full statement. If the reply is negative or if there is any public reference to this exchange we will deny it took place. Silence will be taken as an unsatisfactory reply. The Adams Group wanted to be sure they weren’t going to be undermined by the ICJP. Morrison, according to Fitzgerald, phoned requesting a meeting with the ICJP. Despite their refusal, the Adams Group’s determination to keep abreast of the ICJP’s diplomacy meant he arrived at their hotel anyway. The Adams Group’s own “contacts with the British were continuing through the night”, Morrison is reported to have told them, and “he needed to see the actual commission proposals”. The ICJP gave him a run-down of their discussions with Alison, which included the ‘general gist’ of the proposals between them and the NIO. They also inform Morrison ‘that a guarantor will go in at 9am the following morning, Tuesday, 7 July’. The morning deadline – given in the British offer and confirmed by Morrison’s double checking the ICJP’s arrangement with the NIO – sets the agenda for the next hours to come.